Park Hill offers up bright, open floorplans, high quality construction and appliance as well as proximity to everything you'll need. Restaurants and cafes. Recreation centres and sports complexes. 30,967 and growing! This area northwest of the Township is home to the Civic Facility, Willowbrook Recreation Centre, and Langley Events Centre. This vibrant and growing community features burgeoning new neighbourhoods that provide housing, parks, and ample shopping opportunities. 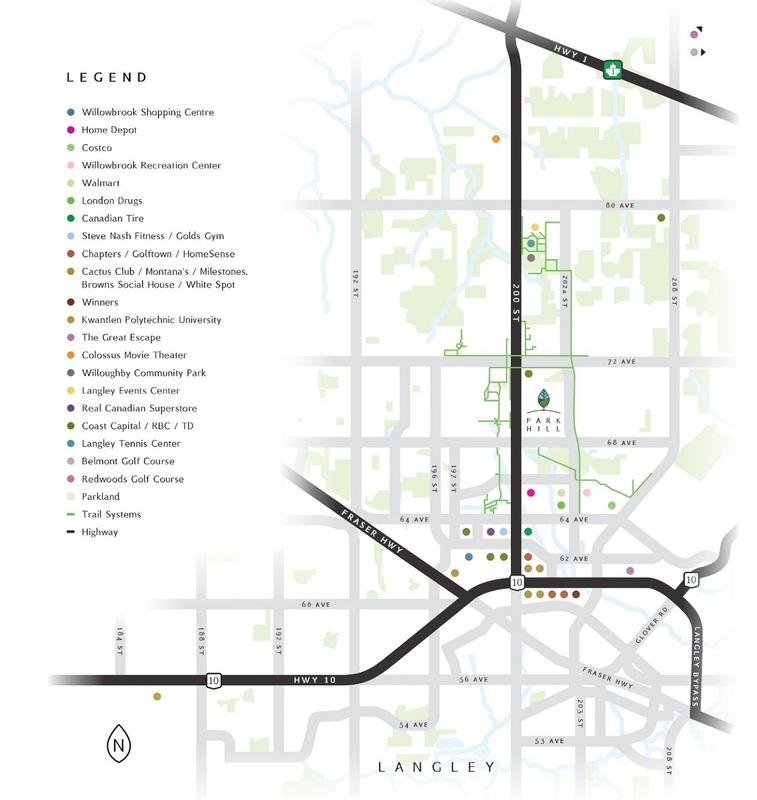 The Township of Langley is largely a suburban community, but, while the center is increasingly urban, the periphery (particularly in the South and Southeast) maintains its agricultural nature. The neighbourhoods of Willoughby and Walnut Grove are quite suburban, and feature large numbers of big-box stores, the Willowbrook Shopping Centre, and the Famous Players Colossus Theatre Complex. Willoughby continues to be an area of residential and commercial growth. Yorkson Community Park will see the opening of three new sports fields and a dog off-leash park. Roadway and intersection improvements including traffic signals will be completed at 80 Avenue, 211 Street, 212 Street and 216 Street to support routes as part of the interchange at 216 Street and Highway 1. A water reservoir will be constructed at 73A Avenue and 204 Street as part of GVWD projects.